"In One World... and Out the Other!" 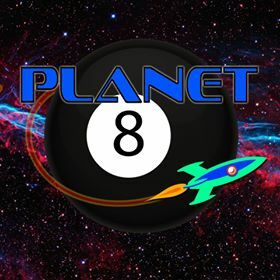 Doug: Wow -- if it's action right off the bat for you, then this issue is right up your alley! Our splash page shows a very distraught Thing running for his life from the lightning bolts of Arkon the Invincible, astride a flying dinosaur no less! As the scene continues, we see New Yorkers reacting in an equally excessive state of dismay as our orange-skinned hero attempts to ward off the savage onslaught. Suddenly Alicia Masters enters the scene. At first she's admonished for not running the other way, but when informed of what is going on, and when a passerby notes that she is indeed blind, he points her in the way of the man she loves. She arrives just in time to see the Thing taken down. 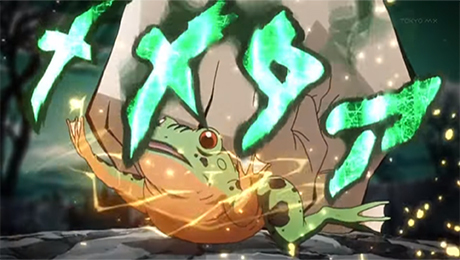 As she rushes to his side, she's surprised at his lack of familiarity, but also of his speech patterns. Arkon descends, and with one more bolt, vanishes with the Thing! Karen: I have to say right up front, I'm not a fan of Chic Stone's inking. He really softens and blurs Buscema's work here. I thought it was interesting that Roy gave the date on the splash page: Feb. 14, 1974. Writers in that time weren't concerned (apparently) about dating a book or locking characters down to a specific time. Now, you never see a date in a comic -even the dates on tombstones are obscured! Doug: Alicia finds a cabbie and asks him to take her to the Baxter Building. The hack is skeptical, as he relates a tale of yore when he had the Invisible Girl as a fare -- that would have been way back in FF #1, right? 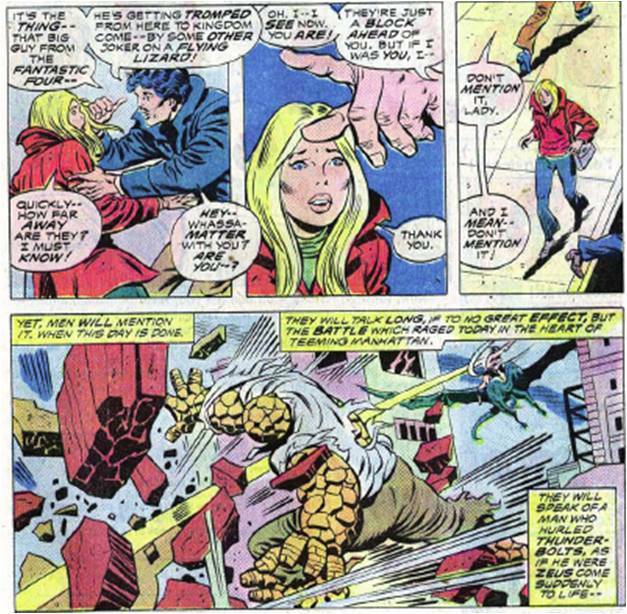 I thought this scene, maybe more than any other, hammered home your comment about Stone's inks; the second panel here really doesn't look like Buscema's pencils at all. Anyway, as they approach the FF's headquarters, a rocket (or was it the pogo plane -- hard to tell from Big John's rendering...) swoops low over Manhattan and lands. The FF are home! Alicia makes her way out of the now-all-too-anxious-to-get-away cab and into the Baxter Building. A short ride up the FF's private elevator and she emerges in the family's quarters. But who else is there? Ben Grimm! Alicia relates her story and asks how it is that Ben is now with her -- he assures her that he'd been in the Great Refuge with the rest of the team. Alicia is very upset, and produces a scrap of the other Thing's shirt as evidence of what she'd gone through. Ben gets an idea, and calls up Crystal on the omni-viewer. 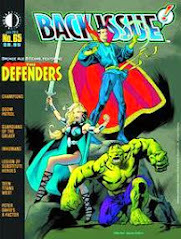 Of course Quicksilver is right by her side, and abrasive as ever. 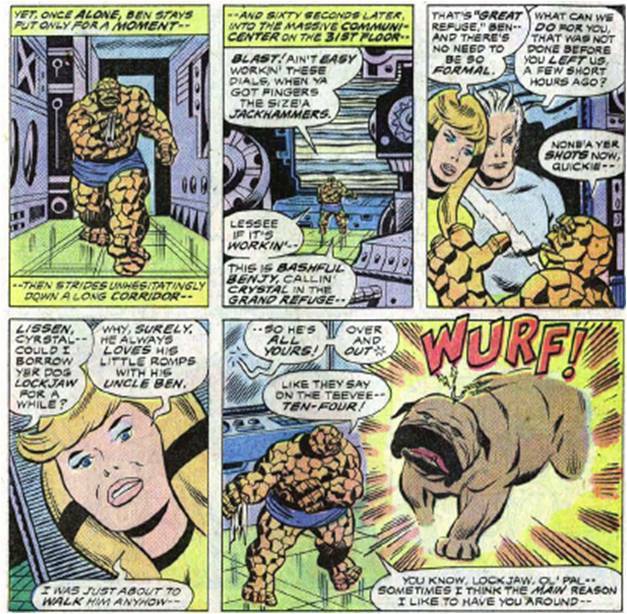 Ben brushes him off and asks Crystal for Lockjaw's services. No sooner is the connection cut than the big pooch appears. Dimension-hopping time, friends! Karen: That was a fun bit with the cabbie and his dislike of the FF. Almost an Archie Bunker-type character, what with his "I'm not prejudiced, some of my best friends are..." comments. I share your confusion over the FF's vehicle -looks like the rocket but lands basically on its side? That was just odd. Doug: Meanwhile, back at the Baxter Building, Reed has called a team meeting for an important matter. 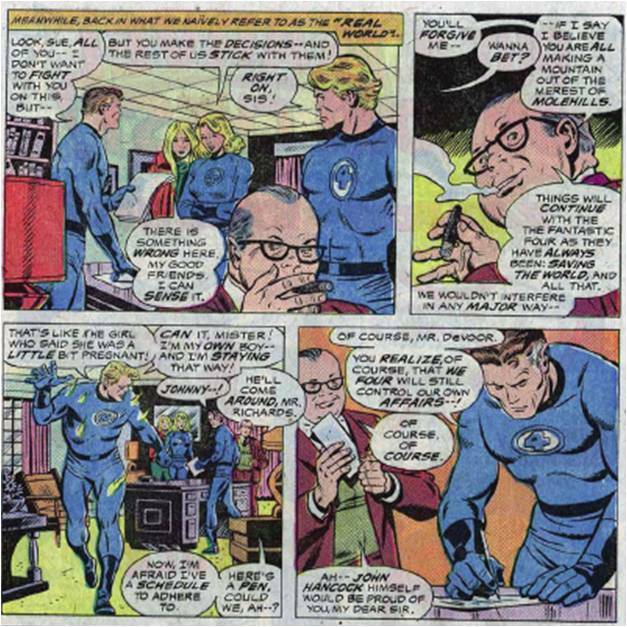 A certain Mr. Devoor is present to make the FF an offer -- due to some decreasing financial worth of Fantastic Four, Inc., Mr. Devoor has approached Reed about buying his majority share in the team, in effect relieving any part of the "family" from control over all of Reed's lucrative patents, etc. 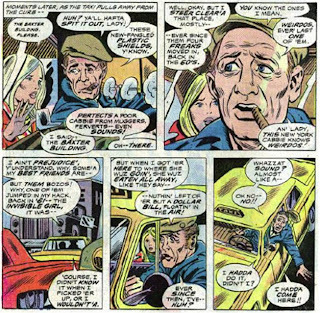 Reed informs Sue, Johnny, and Alicia that he is going to accept the offer! Karen: This illustrates again why I have never liked Reed Richards. Besides lobotomizing his son and treating his wife like crap, he rules the FF with an iron fist! "I own 51% and controlling interest -so what I say goes" -that's just typical of Mr. Big Brain. Oh sure, it may turn out he has something up his sleeve, but he's gonna put everyone through hell before he's done. Doug: I'm pretty hot and cold with Reed. You know, I'm sometimes against profound evolution of characterization, and I'll admit that I'm not up on Reed's doings much over the past 10-12 years (I do know what his role in "Civil War" was). He's just a guy who seems like he has all of the answers and doesn't need anyone else to even voice an opinion. Brainiac-5 would fit into this category as well. 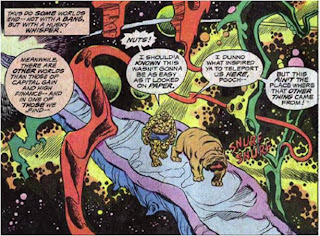 Doug: Back to Ben and Lockjaw -- of course, as any dog would, Lockjaw lands in some crazy Dagobah-scene and begins to chase a refugee from the Cantina. Ben stops him, lets him sniff the shirt again, and they blink out. They rematerialize in a medieval castle, and are soon faced with baddies resembling figures from every monster movie one could imagine! Ben begins to make short work of them when he sees another disturbance. 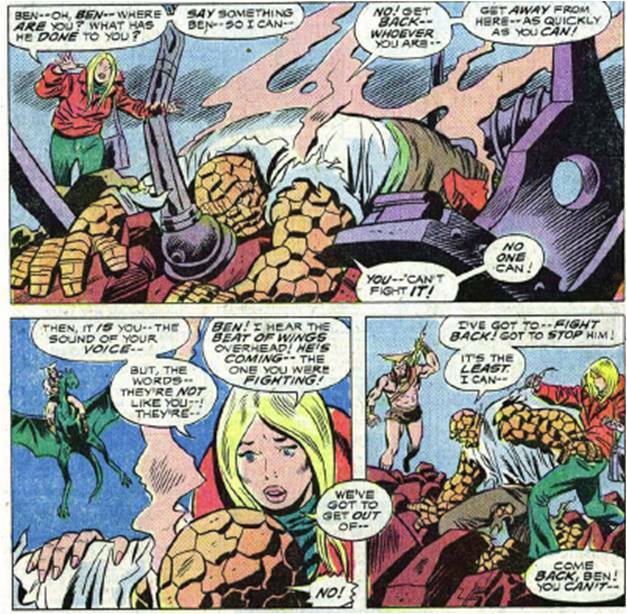 Fighting his way over to it, he's shocked to see himself, in the form of Ben Grimm, protecting Sue from more monsters! 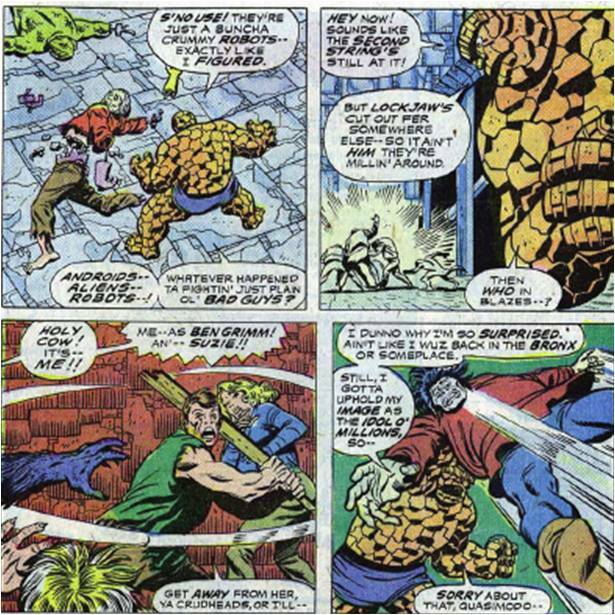 The Thing begins to talk to his alternate self when they are attacked by the largest robot yet -- the Frankenstein Monster! Ben tussles a bit and is actually beaten back, but wins out in the end by punching the Monster through a wall and into the moat below. 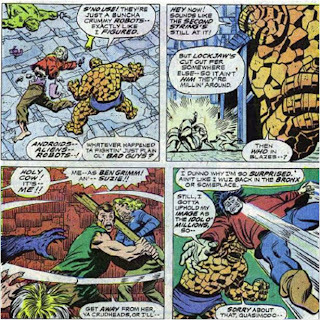 Back to his discussion with Ben, the Thing tells that he's been to this world before (FF #118, we are told) and has met the "other" Reed Richards -- a man subjected to cosmic rays and forced to go through life as an orange-plated monster! 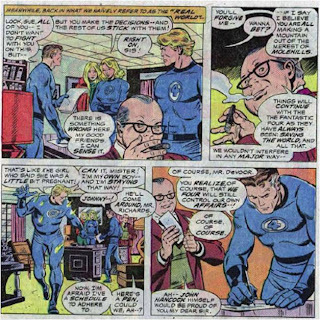 As they walk, Ben remarks that Reed's just put up a sign that reads, "Reed Richards Robotics, Inc. A Division of Inter-Related Technocracies Unlimited". 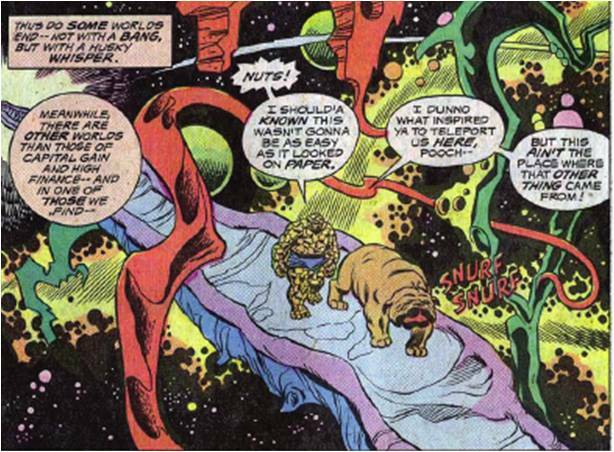 Karen: The side-trip to the Ditko-style dimension was odd to say the least. The robot monsters were hokey but fun -although I have a hard time believing that stiff Reed would even think of designing robots like famous monsters. Actually, why he would live in a castle is also beyond me. I have to admit I have completely forgotten FF 118 - I may have to pull that out and read it before we go any further in this series. Doug: Back on our Earth, our Reed is about to sign a contract with Mr. Devoor that will give over control of many of his inventions to a company called "Interlocking Technologies Unlimited", whose company logo bears a striking resemblance to the enterprise we'd seen in the previous scene. And at that point, the pen with which Reed signed blinks out of our existence. To be continued! This looks like a wonderful issue.. 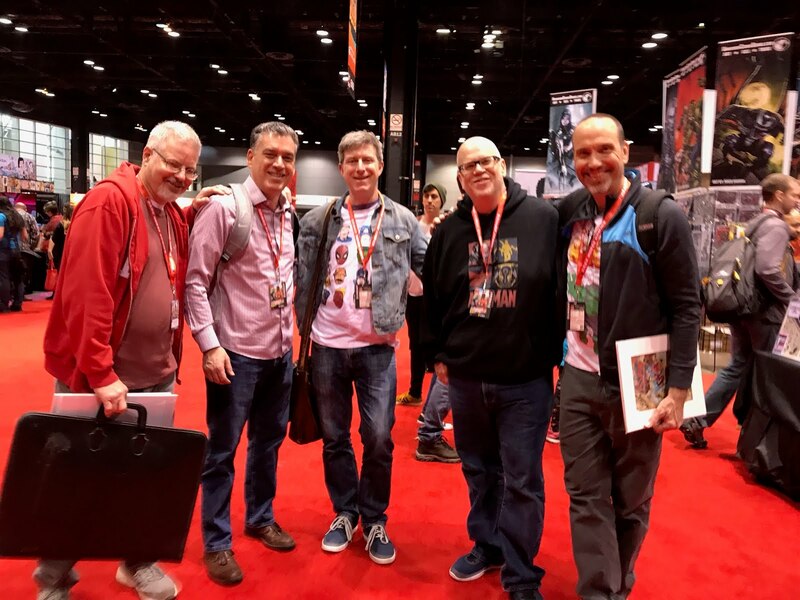 I actually didn't know John B. came back to pencil the FF between Mr. Buckler and Mr. Perez. I'll have to grab some of these issues (I stopped my original collecting at ish 151..). Stone's inking looks alright from these panels, they don't seem to undo any of John's classic and distinctive scene structures. 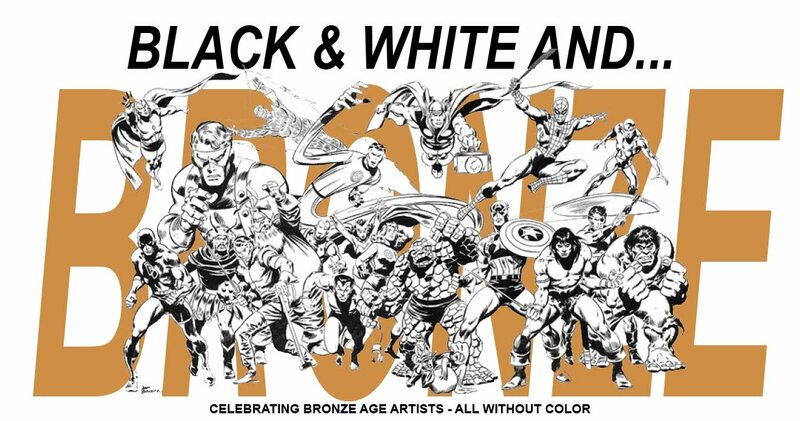 As I mentioned before, even with Sinnott, a softer Buscema isn't necessarily a bad thing ~ It's the nice compromise of the two styles.., which complimented MUCH better than Stone's work with Kirby. 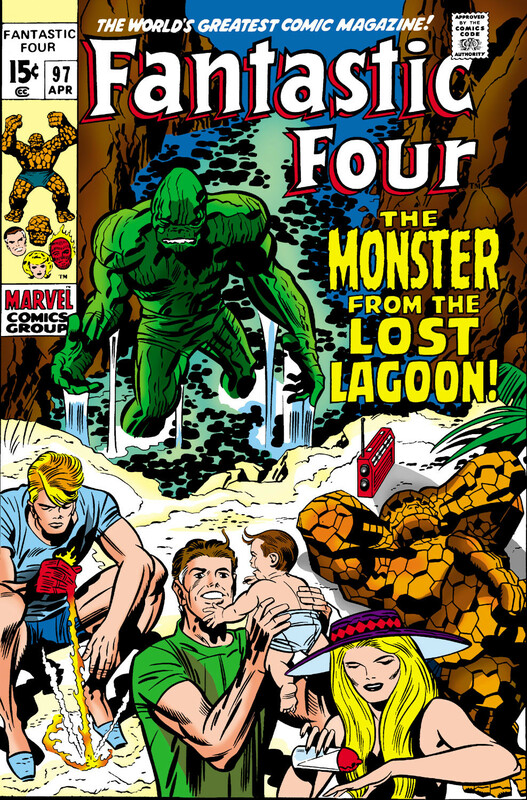 I never read this issue, but I always thought this cover was rather "chatty", even by the standards of Bronze Age covers. I'm guessing Ben doesn't mention Hank Aaron inside the comic? Nice Gil Kane art on the cover. I've never found Arkon very interesting, which is one reason I never picked up this issue. I read his first appearance when it was reprinted in 'Marvel Super Action'. Earth's nuclear tests were polluting his planet, so he attacks Earth. And he falls for Scarlet Witch and captures her. 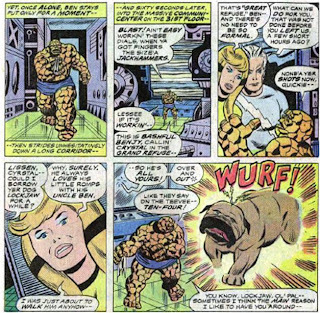 Even as a kid I thought "okay, so he's Namor...but from space instead of under the sea, and he's "in love" with Wanda instead of the Invisible Girl." Oh boy, only three more issues until the epic debut of Gaard! 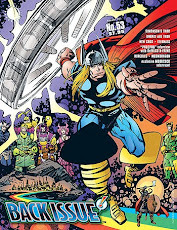 Yes, when is Gaard's new limited series coming out? At least Roy resisted the urge to call they guy "Red Gaard"! 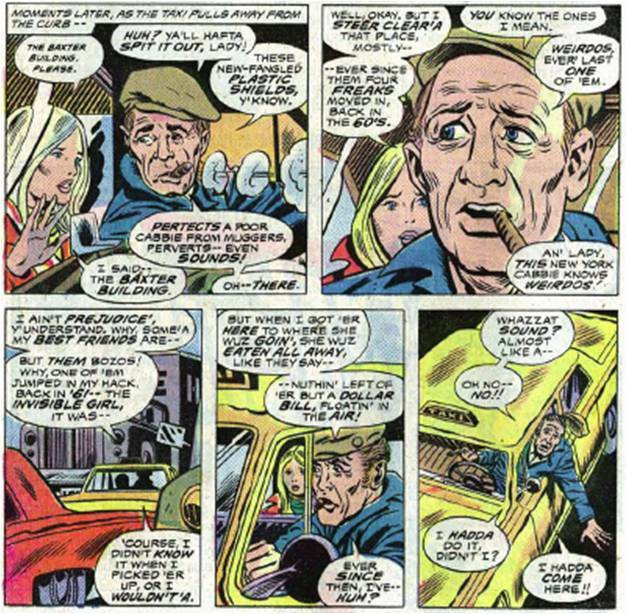 Also, I'd guess it's been a couple of decades since any Marvel or DC characters have made reference to specific decades like that cabbie does here. While not a classic this was still a fun story. Seems by this point, outside of Conan, Roy kept most of his superhero stories relatively lighthearted, albeit with a few serious moments thrown in. 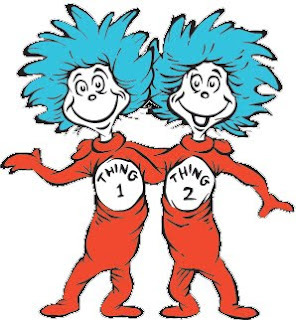 BTW, anyone else suss that Ben & Johnny are essentially employed by Reed? Considering all the work they were routinely shown doing for Reed during the Kirby years in particular and that neither were shown to have ongoing careers doing anything else since that fateful day when they became the FF. Sure, Ben used to be a test pilot and Johnny tinkered around with hotrods, but that was about it. All things considered though, perhaps Reed should have been happy that the Wizard never got a hold of Ben with his Id Machine and convinced him to sue the bejeezus out of Reed for turning him into the Thing!